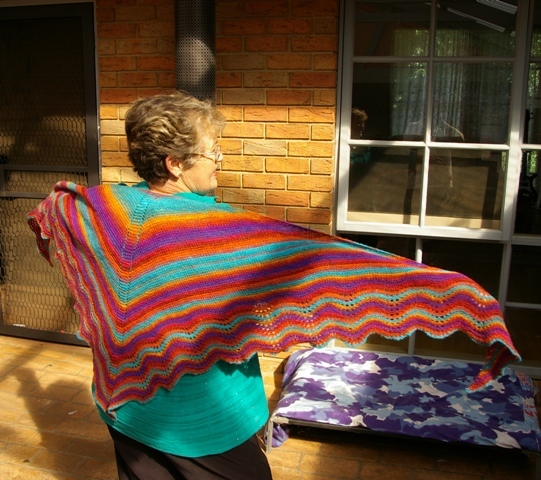 Downunder Discourse | Stitching, Knitting and a book….or two! This year for the first time in many – I didn’t have a gig. My beloved and the kids are in Sydney, out on the harbour enjoying the massiveness of Sydney’s NYE celebrations. I stayed at home…alone…with my music and knitting for company and this morning when I woke, with no hangover (from either alcohol, or exhaustion), I feel ready to welcome in the new decade with all its promises of great things. It’s no secret that 2009 was a less than fabulous year for me, my family and loads of my friends, but there is so much on the agenda for 2010 already that I can’t help but be excited. My work is busy and challenging, but for all those challenges I am still learning and enjoying it! Craftwise – I’ve not stitched much at all but I’ve been knitting up a storm! 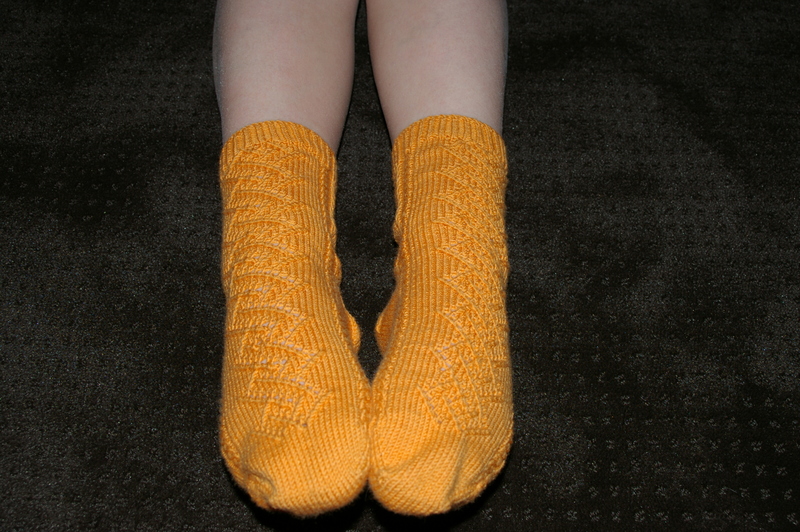 One of the many pairs of socks I knitted this year. Not that I’ve been slacking off at all, I’ve written a ton of new songs, started guitar lessons to help me with the process, revising all the ‘useless music theory’ that I gave away in high school and trying to keep on top of the mothering, housework, etc. While I wouldn’t say 2009 has been one of my most stellar years, the happenings of 2009 have catapulted me into action for the new decade! Much love and best wishes to everyone from me. I had a lovely visit with Marg (who still doesn’t have a blog) and Barb yesterday, nice bit of lunch, some drooling over stitching and lovely conversation! There just aren’t two nicer people in the whole world! I’m so glad they visited. All three of us have fallen in love with this little fella from The Workbasket! I started him yesterday, Cobblestone 28 count jobelan ( I think as I bought this piece of fabric some years ago and there is no colour on the pack) and Kaalund natural silk that I picked up in an odds and ends basket one day and was wondering what I’d do with it. I think he looks a little like Hedwig 🙂 although I am making a great assumption that ‘he’ is actually a ‘he’. The Workbasket - QUaker Owl on 28cnt Cobblestone Jobelan - Kaalund natural silk. I think Barb was ‘scrounging for fabric” last night so she could start him too! Thank you so much for all your lovely thoughts and wishes after the passing of my father. I have chosen to keep them private for now – I hope you understand. They have all touched me greatly and I appreciate the time and thought you took to write. Thank you. It has been an interesting week. I’m very tired and emotional and for a change there’s not a hormone excuse in sight. I attended the funeral accompanied by a very good friend who decided in all her wisdom that I really shouldn’t attend on my own (she’s good!). It was strange to be confronted by pictures of the man I didn’t know, and even stranger to hear the stories of how wonderful a father and grandfather he was. To hear that he remained with the woman he left my mother for all these years was comforting I guess, in the same way that my mother remarried and is still with that man too, it just wasn’t ‘right’ for either of them at that time. I didn’t go to the viewing, and I am not sure I could have done that. To see his coffin there was heart-wrenching and I wasn’t prepared for that at all. I wasn’t prepared at all for the level of pain I felt. It hurt way more than I really expected and I can’t make out if the pain is from knowing that he is now gone, or from the guilt I feel. To hear his grandson deliver the eulogy and see how overcome the grandchildren were to have lost their Poppa gives me some indication of how he might have been in life, loving and devoted to his family, seven children, 22 grandchildren and great-grandchildren too. But I was also sad because I know there are 9 children, and 24 grandchildren. Everyone knew who I was. This in itself was unsettling, to be amongst a group of people I’d never met, but who all knew all the important stuff about me. It’s not that I didn’t feel ‘welcome’, but I felt like I really didn’t have a right to be there, grieving for someone I didn’t know. I felt like I didn’t have the right to cry, I had finished grieving for him years ago, I cried every night for years, wondering why he didn’t want to know me, why he didn’t come to see me, wondering why I wasn’t good enough, and then when I had my son, I went to see his mother (am so glad I did) and took him to see her. She asked me to come back the next day. I learnt that my father went there and waited all day just in case I came back. But I didn’t go – I was too scared, I didn’t know what to say to him, so I stayed away. This will now be the biggest mistake I’ve ever made in my life and I will regret it forever. I visited briefly with the family after the service and was made very welcome. I heard from family members how he remembered me and my brother on every birthday and Christmas, had pictures of me from the newspapers, etc (his mother collected them). He told everyone how beautiful and clever I was. I can understand how it might have hurt the other children for me to be there, but I am so glad I went. My step father found out he had a sister in his fifties…I remember how weirded out about that he was…she wasa hairdressing client of mine for years before we knew….funny I always felt an affintiy with her – we were more friends than client’ hairdresser. But he doesn’t see her now – not since the first time they met. I’m not sure whether I want to, or even can forge a relationship with these people who are my family, or what the niceties of figuring that out are? What if they do and I don’t – or vice versa – what is the etiquette? It’s like walking up to a complete stranger on the street and saying “Hi – you don’t know me but I want to be your family”. BTW I started getting a cold last Wednesday (the same day I learnt of his death) and I slowly slipped further and further into it’s clutches as I missed more and more sleep. I’ll return to normal soon. Today, I learned that my biological father passed away suddenly at the age of 67 years. I’d only met him a few times, but I was aware that I had half sisters and brothers somewhere. I didn’t expect to feel so devastated. I didn’t expect to learn of his passing from my mother who had read the death notices in the paper today. I’d hoped that someone would try and find me. On Friday I will attend his funeral in Hobart and there I will at least see 7 new family members – brothers and sisters – who knows how it will go? I’d spoken about trying to get in contact many times over the past few months, that option no longer exists. It really does hurt more than I thought it would. He was my father after all. I have a contact for care packages containing under garments and clothing for women. If you know a woman who lost clothing etc in the fires, please contact me and I can pass on the details for you. Marysville WAS a gorgeous little town, with so much to offer. We went there often, to visit the mechanical toys shop (which also housed a collection of historical Meccano models), picnic and walk to the falls. Bruno’s Gardens….gone too…a man’s lifetime of work that he so generously shared with all who went there. Strathewen and Kinglake – nothing left. And to think – these towns are less than 100 kilometres from the centre of Melbourne. I am feeling incredibly sad/guilty/ *insert undescribable feeling of something* here. Australians are well known for digging deep, but I think for this one, we will need to call in favours. 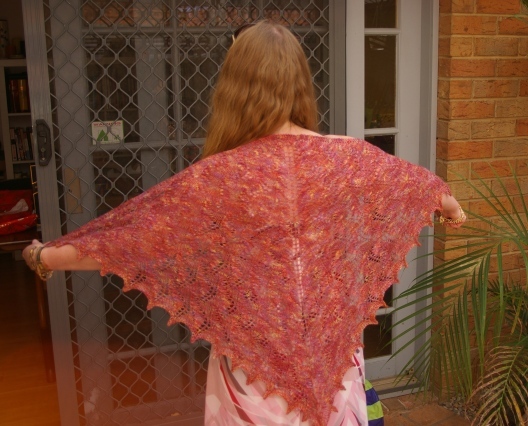 Rachel Power has posted about “Handmade Help” where crafters can donate proceeds from the sale of their handmade goods.